Everyone likes to feel special, taking a cottage break away somewhere romantic with the one you love can be a great opportunity for reconnecting and spending memorable happy times together. Arranging an unexpected break away can be a romantic gesture but take care to make sure your loved one knows that a surprise is planned and that you will be spending time away together. Romantic breaks are often associated with going abroad but there are so many beautiful parts of the UK for romantic breaks away that it is often not worth travelling abroad. 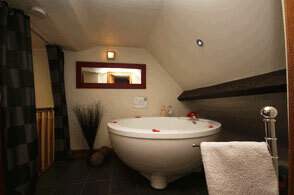 If you like the look of the tub for two on the left scroll down this page to find out more about this cottage. 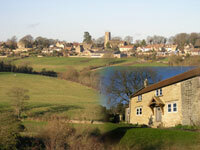 Click to view all romantic cottages in the UK. In England there are many areas of gorgeous countryside and chocolate box villages and cities including Stratford upon Avon and Bath. Whereas in Scotland what could be more romantic than a break in the beautiful capital city of Edinburgh or a cottage break near a loch or with a mountain view. In Wales the Pembrokeshire coast can be great for igniting your passion with spectacular scenery or how about a mountain view cottage or a log cabin in Wales? Ireland is such a gem of a country that it is just ripe for passionate self catering breaks. Location is important. Some find a country setting romantic where you can feel really relaxed whereas for others it's important to be in an attractive town or city where you can enjoy walks and visiting excellent restaurants. Need some inspiration? How about a place with real atmosphere? Staying somewhere conducive to a loving mood can create a special ambience and the ideal setting for romantic moments. Self catering windmills - perfect for creating a unique feel for memorable romantic breaks. For river views and feeling close to nature, how about a self catering houseboat. Again, with houseboats, you can book a break to remember where you can hopefully share special times. Going somewhere out of the ordinary can be just what is needed to get that passion burning once more. Many find that loves light shines particularly at the seaside and coastal breaks can be really passionate affairs. Spend time cuddling up and watching the sea, it's the stuff of dreams. What gives a certain place an air of romance will depend on what appeals to you and your partner. Some dream of loved up nights in front of roaring fires, sharing a hot tub or spreading out on a super king size bed. For others a four poster is what really makes them feel like loving. Men do remember that women like to be wooed but ladies remember that men like to be charmed too. What to take on your romantic break will depend on how long you have been together and the openness of your partner but champagne and strawberries never go amiss. For those who have a sweet tooth chocolate body paint can help create a fun affectionate mood. This cosy country cottage in Warwickshire can be booked for romantic breaks. Enjoy splashing around in the large round tub that takes two, perfect for that loving feeling and enjoy taking walks through the surrounding countryside and may be even watch the stars at night. 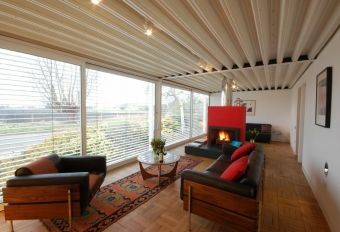 For a romantic retreat with a difference then how about this architect built cottage, with a countryside location not far from Ely in Cambridgeshire. Enjoy watching the sunset from the comfort of the cottage courteousy of the floor to ceiling windows in the lounge or sit out outside and enjoy the peace and tranquillity in this place. Or just curl up in front of the log burning stove. This unique cottage for two really offers something truly special. Click on the photograph for more details. With a name like Kissing Gate Cottage, this cottage certainly deserves a mention when it comes to finding a cottage ideal for affairs of the heart. This cottage is located in the on the edge of the amazing Cotswolds region and enjoys countryside views. Features of Kissing Gate Cottages include exposed beams and open firest. The accommodation is of a high standard and there is a king size bed in one of the bedrooms.